Today is the Feast of the great English mediaeval bishop, Thomas Becket, who was martyred for his defence of the Church in 1170 within his own Cathedral of Canterbury by knights of King Henry II. 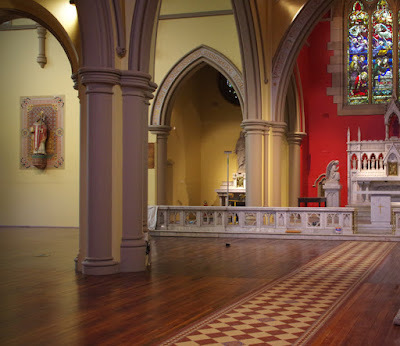 To commemorate this Feast, we wish to continue our description of restoration work on a church in Sydney (Australia) which is under the patronage of Saint Thomas. The church of Saint Thomas of Canterbury (also known as Saint Thomas Becket's) was erected in 1887 in the Sydney suburb of Lewisham. 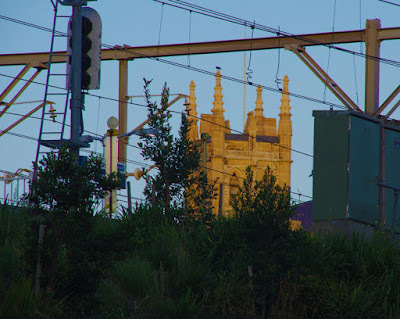 Because of its proximity to the railway line which runs into the centre of Sydney from the North, the splendid Gothic Revival tower of the church is seen by thousands of people each day as they pass by in the city's trains. Earlier this year, the Saint Bede Studio was approached to be a consultant on the restoration of the interior of this church. Walking into Saint Thomas' for the first time on Easter Monday 2017, the impression was of an Old Lady of great dignity, largely intact, but of greatly faded glory, cluttered by successive generations of alterations and accretions. It was a great challenge to devise a near-complete interior re-ornamentation within the constraints of available time. the wiring and gantries of the railway. The Studio's commission was to devise a colour scheme for the repainting of the church, to devise an ornamental scheme for the Chancel and its adjacent chapels and to advise on heritage restoration generally. 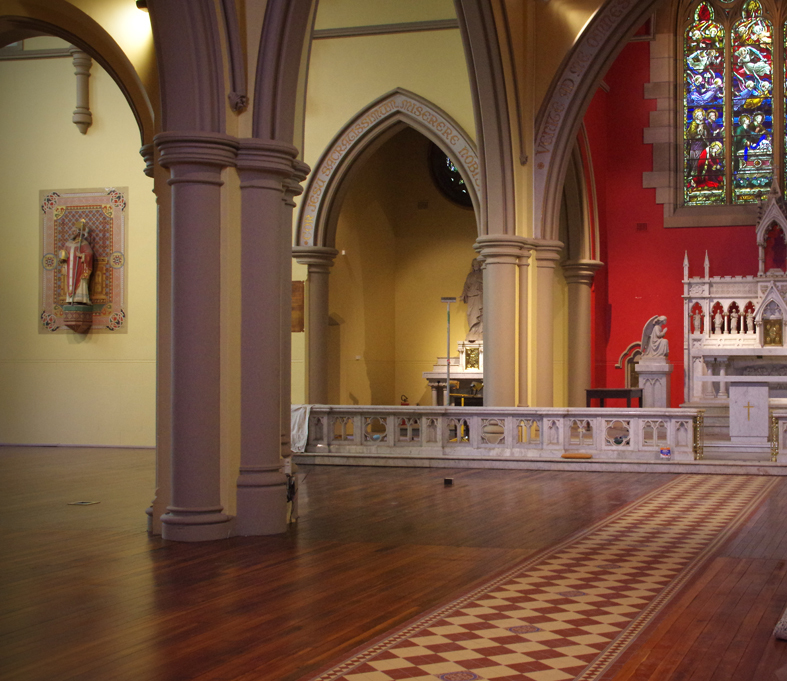 In this work, we received much practical support from the pastor, Father Samuel Lynch, parish assistant Mr Stephen Smith and artisans Mulholland Restoration and Decorating of Melbourne. and the new colour scheme for the walls of the building. On this blog, we will be presenting a series of posts detailing the philosophy underpinning the Studio's work at Saint Thomas' as well as the stages of the buildings development and restoration. For today, however, just a few photographs of the interior work, as an appetiser. The quatrefoil shewn in Figure 1 was designed by the Studio as part of the ornament of the East wall of the chancel of Saint Thomas. It is a stylised rendering of the initials STB Saint Thomas Becket, the T being rendered as a sword in order to depict the manner of Saint Thomas' martrydom. for the east wall of the chancel. Image : Mulholland Restoration and Decorating.